kickstones wrote: There is also a search engine for photos of the runners which confirms the two runners behind Lubitz, however no sign of Lubitz in these pictures. Nor can any be found through his race no. 403. Unless there is some other logical explanation, than either the official times are wrong or the supposed image of Lubitz has been inserted. Kickstone, very good findings! Your observation about the discrepancy with Strudel Banzai and the people around him seems very valid! Unless, I don't know, at the end of the marathon they went a couple of times around the track, I'm not an expert, I can't tell if they would do that. Also very fishy that his name and his name only would not appear on that other page. As if they had prepared a placeholder and forgot to fill it. It seems to show that the fake character of Strudel Banzai might have been superimposed to a real competition. Of course this implies that some of the other competitors, at least those included in those pictures, are probably in on the scam, otherwise they might come out to say "I don't remember him". This is nothing special and has been done many times. All you need is some "brother" of some masonic group or tribe, and the airline companies certainly don't lack in those ones. The Boston marathon goes to show that no matter how public, how collective an event is supposed to be, it is always possible to take it over and use it as a stage. Just one note: when you link to the source of a picture, you cannot link to the picture itself. We already have that link in the picture embed. The father of the Germanwings co-pilot who allegedly deliberately crashed his plane into the French Alps, killing all 150 people on board, is “devastated, completely shattered” by his son’s act, a French official who spoke to him said. “He is carrying on his back the entire weight of the drama. He is a man whose life has broken down,” said Bernard Bartolini, the mayor of Prads-Haute-Bléone, a small town near the site of the crash. The parents of Andreas Lubitz have not spoken in public since the crash on Tuesday. They were questioned by French police during their stay in France and German police were due to talk them when they returned to Germany. Mr Bartolini said he met them when they visited the crash site and attended a memorial ceremony nearby on Thursday along with families of the passengers and crew who died. “He (the father) is a man whose life is in ruins. I felt incredibly sorry for him as he expressed all his emotion, he expressed his emotion because he has lost a loved one, but also because his son is perhaps the (cause) of all this tragedy,” he told BFM news channel. So, Lubitz father also went on the tour with all the victims... and yet is life "is in ruins". The lack of logic and sense and reality is staggering. Crash scene investigators have found body parts thought to belong to the co-pilot of the ill-fated Germanwings flight that crashed into the Alps, it has been claimed. We are also told that the speed of the plane was 500mph. And Strudel Banzai was right there at the front. The plane got shattered in a million tiny pieces. A DNA test takes weeks. AND YET, with ho further detail, we are informed that they have found the body parts. I can't say if this is real or not. Well even if it would be "real" in a sense of that the video is assumed to be the actual amateur video, it still would be fake, as the whole Germanwings case just seems to scream hoax. Tarek, this video is another scam. I've already asked you to please refrain from posting such videos (let alone re-uploading on live leak, which only serves to make the source even more confusing: WHY DO YOU EVEN DO IT?). I've told you to please WAIT for the moment when the mainstream media will give you a story and a source that it is supposed to be "authentic". It is a tragic waste of time, and a direct pollution of the research, to submit videos from unknown sources "picked up on youtube". "Found the video on Youtube; It spread like fire; I decided to reupload it on liveleak": these are all signs of a lack of method unacceptable for this forum. According to this article, the alleged video of that cell phone has indeed not been released on the internet. What is funny though is that they say: "there is no doubt that the video is real". De data van de video zouden exact overeenkomen met de data van de zwarte doos. Er wordt niet getwijfeld over de echtheid. De smartphone zelf was kapot maar het geheugen was nog te lezen. De media hebben de opname niet online geplaatst. kickstones wrote: This might be of no relevance Simon, please feel free to delete the post if not, however, it may be the media have manipulated images, to enhance the story, in this instance. And remember if the image has been manipulated what does it say about the story? Strange coincidence with the number Lubitz is wearing in that photo - 403. It so happens that the Germanwings airline that supposedly crashed in the French Alps had the Flight Number - 4U 9525. Also interested in the word that looks like Spiridon printed on his number tag. Spiridon (also known as Zaleria) was the homeworld of the Spiridons. The planet was used for a base by the Daleks in the early 26th century in their plan to destabilise the galactic balance of power before an invasion in force. mnew9 wrote: Strange coincidence with the number Lubitz is wearing in that photo - 403. While I do believe that some of the freaks out there who comprise what we'd call the "elite" believe in numerology, I do not believe that your particular method proves anything at all. Given a string of say, four or five random digits you can, with arbitrary addition, subtraction, and so forth, come up with any other string of digits you wish. This sort of thing is just not helpful, especially since it proves nothing. What are we all supposed to gather from posts like this? Sorry if I seem harsh but I don't think you're onto anything with your method. I see no harm in analysing things on pictures submitted by TPTB in support of one of their psy-ops. Questioning things indicated on such pictures, whether out of fun or query, may well help someone else to 'see' something or make a connection with something else that others may have missed. Numbers/numerology can be weaved and twisted in many ways to make it fit a certain condition but it's there nonetheless. The trick is not to be overly consumed with it in the way TPTB may well want hence them putting it there in the first place. I've been looking in too gematria and symbols but it's just confusing with all this numbers, colours and symbols. Almost all numbers can be some sort of magic numbers. You got all kinds of animals that is supposed to be some sort of secret symbol. All of these things are probably just another rabbit hole and to get people confused. Still numbers can be good clues whether something can be a hoax. This is my first written post, you can find my introduction here viewtopic.php?f=32&t=838&p=2395006#p2395006. I decided to start posting as my main hobby is running and I have a personal best for half marathon (1:38:24 https://connect.garmin.com/activity/501723281) very close to the race time of Lubitz (01:37:09). mnew9 wrote: Spiridon (also known as Zaleria) was the homeworld of the Spiridons. The planet was used for a base by the Daleks in the early 26th century in their plan to destabilise the galactic balance of power before an invasion in force. Spiridon is in fact a running and triathlon club, here is their homepage http://www.spiridon-frankfurt.de/. It's not unusual to see such names on the race numbers, in fact it's very usual. 1. Usually the finish line "gate" is very big and there's no place to go around it. 2. There are sensors at the finish line and depending on the sensor type, if you pass next to it in order to go for another lap, it can stop your timing. 3. Even if you go for another lap, since there are a lot of participants, you risk to intersect the slower runners as they enter the arena. I could not find an official race course but a lot of runners track their race using various gps watches or smartphone apps. http://runkeeper.com/race/lufthansa-halbmarathon-2890/37133 it requires youy to register on Runkeeper (takes 2 minutes) and after you do that you can see the course. As you can see, the start was outside the arena so the pictures taken with Lubitz running inside the arena are from the finish. Looking at the entry point, you can see that the total distance that they run inside the arena is around 100 meters, so the pictures must be taken here. Which is odd, in that on first inspection the other race numbers have a name linked to it. 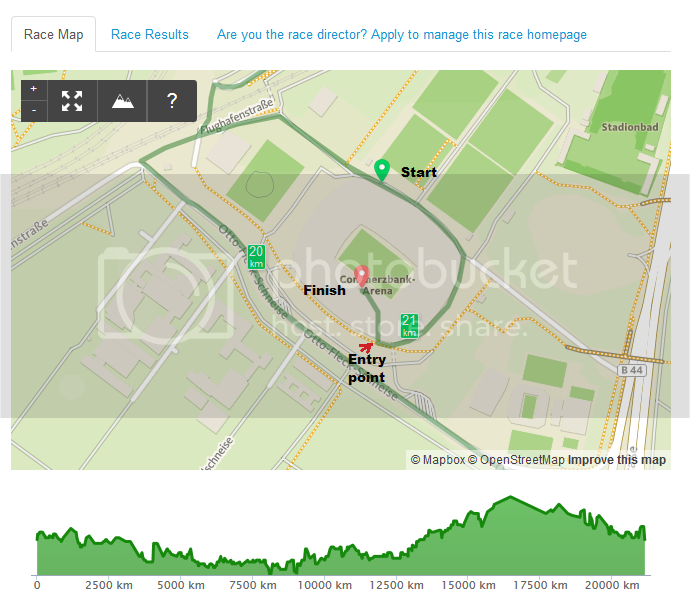 we can see that the race numbers 1371 and 3192 finished almost two and a half minutes in advance of Lubitz. This is not possible, in that picture, Lubitz is at full speed, and from my personal experience I can tell you that the adrenaline rush that you have in this spot of the race makes you forget about any pain that you might have, so you can exclude any injury. So how can a guy running at full speed, can lose two and a half minutes in 100 meters while he was ahead of the other two racers? pov603 wrote: I see no harm in analysing things on pictures submitted by TPTB in support of one of their psy-ops. There is harm to a useful discussion - without a method it is not analysis and by addition, subtraction, and so forth one can cause any random string of digits to associate in any way one likes with any other random string of digits. Maybe this sort of game needs its own thread but I don't think we should play these games all over the board. If I was more jaded I'd suggest that these kinds of posts are page lengthening spam right out of The Gentleman's Guide to Forum Spies. Serik wrote: I've been looking in too gematria and symbols but it's just confusing with all this numbers, colours and symbols. Almost all numbers can be some sort of magic numbers. You got all kinds of animals that is supposed to be some sort of secret symbol. All of these things are probably just another rabbit hole and to get people confused. Still numbers can be good clues whether something can be a hoax. Once you get into the habit of seeing so-called "gematria" type symbolism everywhere you can have a party with any group of numbers, making them come out however you like. Is this forum just to become another Godlikeproductions.com where the lunatic fringe come to spout their star seed light working gematria nonsense? I sure hope not. There are plenty of boards out there where the audience will applaud any random mathematical "numerology." However, runner on left with blue shirt (5617) who is also in pictures with runners 1371, 3192, and Lubitz, finished about the same time as the Germanwings co-pilot. If Lubitz was pasted in with a group about to pass the finishing line over two minutes before Lubitz is supposed to have finished the course, how do we explain the presence of runner 5617 in this same group ? Allow me to share with you another brainwave of mine. I am sure that the people who put together the news blocks, take into consideration a thing called "cognitive bias"... or is it called "information bias"?... be that as it may, I am talking about how we (our brains) treat new informations that we receive: those that fit in into our view of the world, our "narrative" of the happenings around us, those bits of information we keep and with their help we build our picture of the event, while those informations that do not fit we discard and disregard, or outright ignore. Let me give you the example of the present case: the Pick-Up Artist community blogs about how the pilot's unsuccesful relationship with women led to his mass-murder/suicide, which could have been prevented with him learning Game. The Anti-Semitic bloggers seem to discover the pilot' Jewish, Askhenazi/Khazaar ancestry. Those who believe in the Illuminati NWO also found their proofs. And I am sure some data verify the suspicions of the believers of the lizard people. Into this tendency fits IMO the rose/Pagan findings. BUT: the resource of ALL this information is the MEDIA! And the source does not give real information, because we are living in the Information Age, where information is power, and those who have the power will not share with those who do not have it! See what I mean? And I think those people who put together the news, especially now after 9/11 when the alternative truth-seeking became a worldwide phenomenon and which became branded as conspiracy theories, take into consideration this phenomenon, and on purpose give - sometimes outright contradictory - facts, fragments of info in these stories, for the people to "find" and then to keep or to discard depending on their information bias and to chew on the end result. Wasting of time. It is Infotainment. The time you use up to watch TV is time to spent in vain, and this time you will never get back, and do not forget: our times on this Earth is limited! Maybe this is one of their main goal to achieve for us to waste our time on nothing productive or valuable? So spend your time wisely! Not all of these parts have been traced back to the people that had been on board the plane, which was en route from Barcelona, Spain, to Düsseldorf, Germany, when it crashed. A French official has warned that it could take up to four months to match all the body parts with victims, using DNA provided by families. So we are led to believe that in the space of nine days since the air crash, the authorities have been able to find 2,854 body parts in rugged terrain, sent them all for analysis and discovered DNA from ALL of the supposed 150 victims. Absurd! You are indeed correct in your brainwave; the phenomena has been labelled 'confirmation bias', the idea that people have the tendency to attend to or pick out information that supports their own interpretation of events or world view. It's considered among a list of around 15 'cognitive distortions' from memory, which basically amount to 'faulty thinking patterns' where certain 'evidence' or ideas are given priority while others are marginalised or dismissed. (Interestingly, this is what you almost always see with 'depressed individuals', who tend to more readily identify with negative ideas of self/the world/the future and seldom acknowledge/perceive positive aspects. Thus, treating people with depression generally involves getting the person to 'challenge' their own beliefs and seeing if they can 'replace' them with more 'realistic' and 'helpful' ones). The 'cognitive dissonance' one you also might be thinking of is where people experience two or more conflicting ideas, where perhaps 'new information' might challenge their previously held beliefs and creates an 'inner destabilisation' of sorts. 7. Pair fear-based stimuli with another stimuli, whereby consistent conditioning leads the second stimuli to elicit the fear-based responses of the first by association (i.e. Ebola and the colour green; see green - brain is trained to evoke fear-response). What it amounts to, effectively, is domestic violence (i.e. physical, emotional, psychological, financial, spiritual abuse) on a societal scale.